Alfredo Corchado grew up in El Paso, on the border. 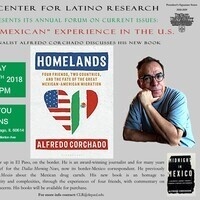 He is an award-winning journalist and for many years Mexico City bureau chief for the Dallas Morning News, now its border-Mexico correspondent. He previously published Midnight in Mexico about the Mexican drug cartels. His new book is an homage to Mexican-American Identity and complexities, through the experiences of four friends, with commentary on migration and border concerns. His books will be available for purchase.